Laser Range Finders fall into three main types: golf, hunting/nature ranging, and forestry. Golf range finders are designed to locate the thin, vertical flag stick and separate it from the background. Range finders for hunting, shooting, and general measurements look at larger things that are easier to isolate. While most rangefinders are monoculars, hunting rangefinders are also available as binoculars. Some golf and hunting range finders have the capability to account for a difference in elevation between the start and end of a trajectory (ballistic ranging). Forestry range finders are used to determine both the distance to a tree and how tall the tree is or how far a nest is from the ground. As with any tool, select the rangefinder that fits your intended use. Our favorites range from the inexpensive reticle Leupold RX-650 Laser Rangefinder Black to the top-of-the-line Leica Geovid HD binoculars with integrated laser rangefinder. 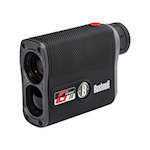 In the middle price range is the Bushnell line of Yardage Pro rangefinders. In the Nikon lineup are models that give an LCD readout. All Zeiss range finders have ballistic ranging. We are sure to have one that will work for you. Rangefinders have many uses for outdoor activities. They can be used to determine the distance to a target for hunting or precision shooting sports. 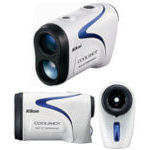 Golfers often use rangefinders to take some of the guesswork out of driving a ball down the fairway. Wildlife researchers, birders, and even forest managers or loggers may use them in the course of their work, too. 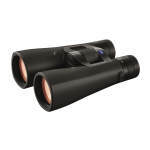 Optics4Birding offers our customers one of the largest selections of rangefinders found on the Web. The laser rangefinders we carry come from some of the most highly-respected manufacturers in the optics industry. Which Rangefinder Should I Buy? Believe it or not, the staff at Optics4Birding gets this question a lot from our customers. We can help you select the best rangefinder for your outdoor needs, and are happy to offer you some basic information on the types and models of rangefinders to help you decide. Laser Range Finders fall into three main types: golf, hunting/nature ranging, and forestry. Golf range finders are designed to locate the thin, vertical flag stick and separate it from the background. 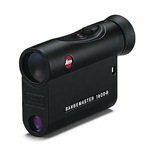 A good example of a golf range finder is the Leica Pinmaster II metric/yard rangefinder. Another is the stylish and portable Nikon CoolShot 20 Golf Rangefinder. Range finders for hunting, shooting, and general measurements look at larger objects that are easier to isolate from the background. A great shooting sports rangefinder is the Leica CRF Rangemaster 1600B Laser Rangefinder, while a more budget-friendly model might be the Nikon Aculon Rangefinder. While most rangefinders are monoculars, hunting rangefinders are also available as binoculars. A top of the line choice in binocular rangefinding is the Zeiss Victory RF 10x54 Binocular Rangefinder. Some golf and hunting range finders have the capability to account for a difference in elevation between the start and end of a trajectory (ballistic ranging). Forestry range finders are used to determine both the distance to a tree and how tall the tree is or how far a nest is from the ground. 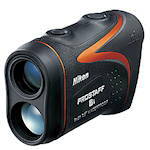 The Nikon Forestry Pro Laser Rangefinder serves as a perfect example of a pro-quality tool used around the world in the forestry industry. As with any tool, select the rangefinder that fits your intended use. All laser range finders work by sending a narrow laser beam toward an object and measuring how long it takes that beam to be reflected back to the rangefinding device. This is called the “time of flight” principle. Consumer-grade rangefinders are generally accurate from a few millimeters to a couple of feet, with more accuracy in those that use short laser pulses and fast detector circuitry. Most rangefinders feature a digital readout to help you quickly determine how far you are to your target. Rangefinders come with different optical coatings, weatherproofing, and rubberized bodies. Some offer good magnification, allowing them to be used as both a spotting optic and a rangefinder. It is important to understand how you will use the optic and what sort of weather or field conditions you expect while using the rangefinder to help determine which one is right for your needs. Do You Carry Rangefinder Accessories? To help you get the most out of your laser rangefinder, Optics4Birding carries a selection of tethers that clip the rangefinder to your vest or jacket can help protect your expensive optic device from loss or damage, keeping it handy while you’re enjoying the outdoors. The selection, the pricing, and the variety of rangefinders that Optics4Birding carries makes us an industry leader in retail optics sales. We are serious about outdoor activities like birding, wildlife observation, and sporting events, and we are committed to providing our customers with the best equipment at the most competitive prices. Our company has earned its reputation for quality, and that quality is backed by some of the most outstanding customer service in the optics industry. Optics4Birding stands behind every product we sell with our signature no-hassle return policy and our easy-to-use online shopping storefront. In addition to our selection and service, Optics4Birding proudly offers our customers our exclusive Price Guarantee. We will meet or beat any advertised price from an authorized dealer on the same item. Best of all, most orders ship free!